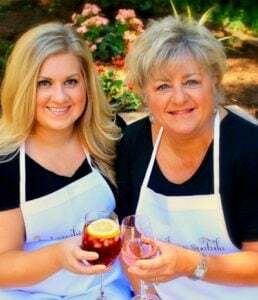 You are here: Home / Cake Recipes / Fresh Key Lime Cake! Who says Key Lime has to be a pie? 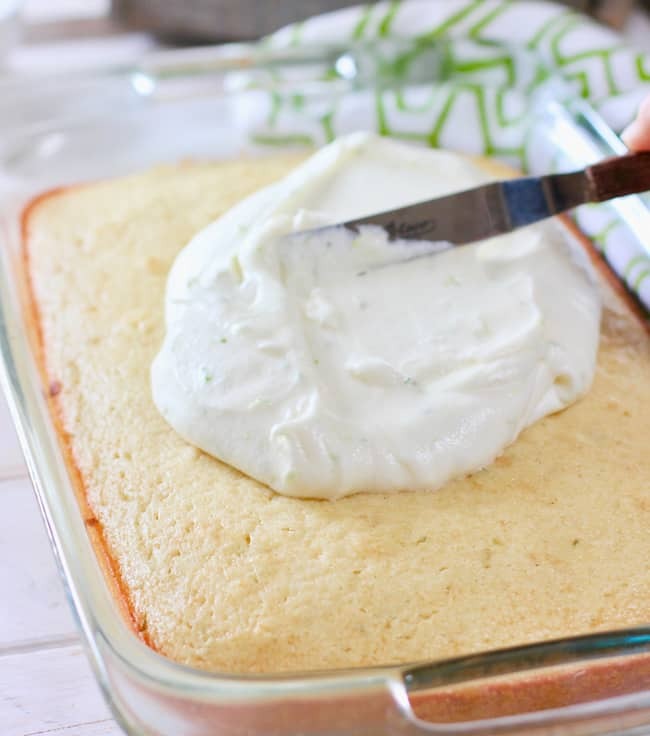 You are gonna fall in love with this easy to make Fresh Key Lime Cake! And here is a secret, you don’t have to use Key Limes...regular old limes work just fine! We all know about Key Lime Pie – but I like my dessert in cake form. I want cake, cake and more cake! Nothing against all you pie lovers – I got nuthin’ but love for ya. It’s just this thing, this thing with cake, it’s big…and it’s getting bigger! Well everything is gonna get bigger if I don’t stop making cake every weekend…ugh. But I do share, so that makes it okay, right? 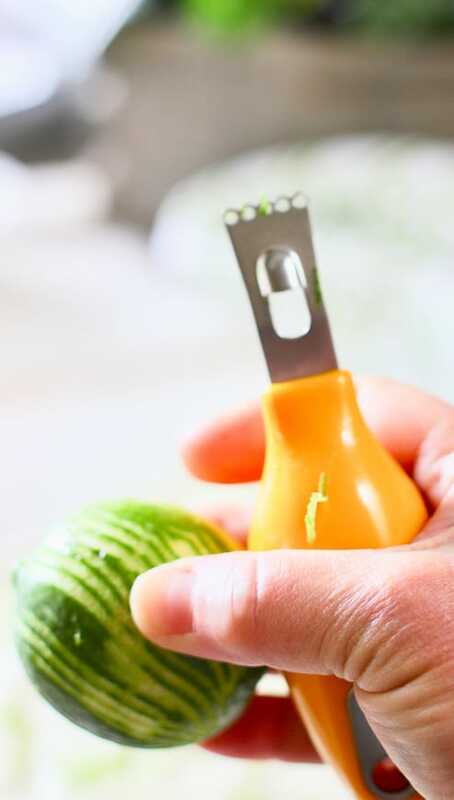 and they are a little easier to zest…key limes are tiny little suckers and you can easily zest your finger tip off. Not a good start to cake day. Cake fixes a lot of things but it won’t make you grow your finger tips back. 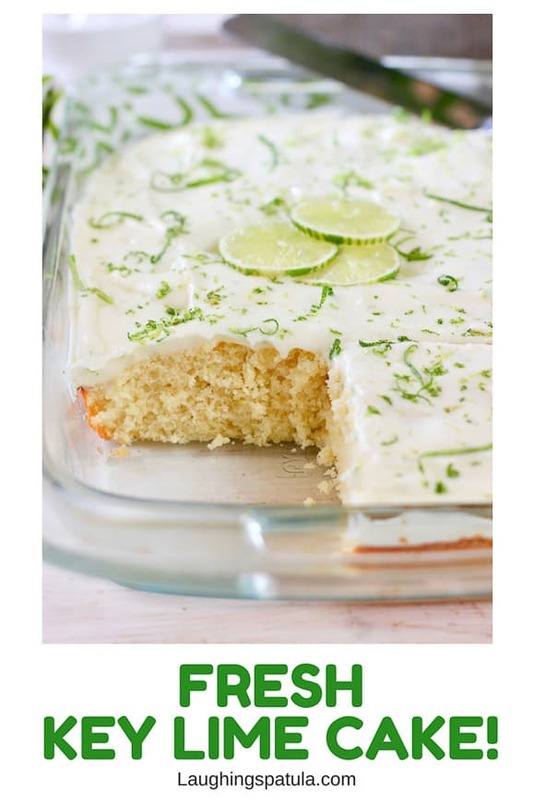 Whether you use Key Limes or regular Limes, you are going to love this easy to make fresh cake! The batter is your basic cake ingredients plus a bit of lime juice and zest. Watch those finger tips when zesting! Once your cake is baked and cooled, it’s time to slather on the cream cheese and lime frosting. I do so love that word slather…. Now zest some additional lime to decorate. I found this cool little tool in my bar stuff. It made little confetti looking lime strips! Chubby fingers make great cake and they hold a lot of frosting for extra taste testing! And now to do what I do best….EAT CAKE! We love the fresh taste. No ultra green color added. You don’t want your cake to look neon! We love to make easy and fresh cake and you can see all fo them HERE! One of our favorites is our Chocolate Peanut Butter Cake. You slather peanut butter right out of the jar onto chocolate cake, then top with a 5 minute ganache frosting you make in the microwave ! Super big flavor bomb! Here is to cake and all it does! 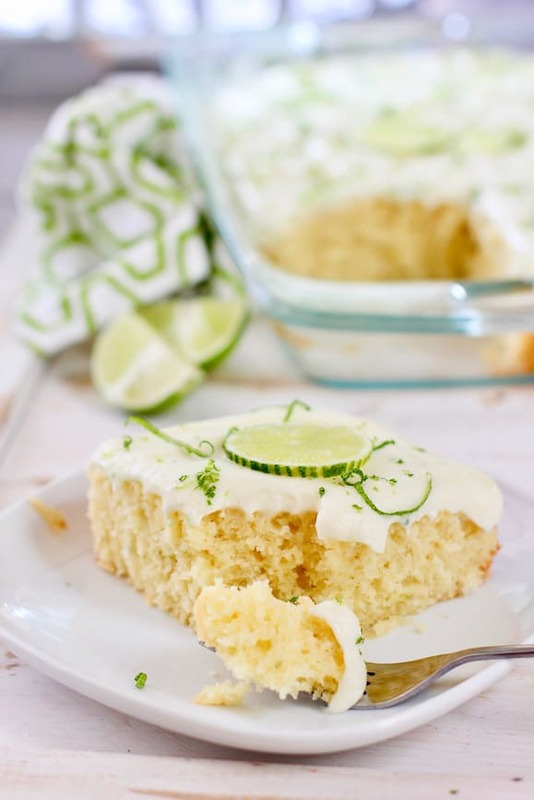 You will love the fresh taste of this Key Lime Cake! Key Limes or regular limes will work. It is tender with a tangy fresh flavor we love! Preheat the oven to 350°F. Spray a 9" x 13" pan with non-stick spray. Mix together butter and sugar. Add eggs one at a time. Add milk, vanilla, lime juice, lime zest to combine. Pour the batter into the prepared pan. Bake for 25 to 30 minutes or until a toothpick inserted in the center comes out clean. 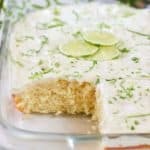 Cool cake and frost with Fresh Lime Frosting. 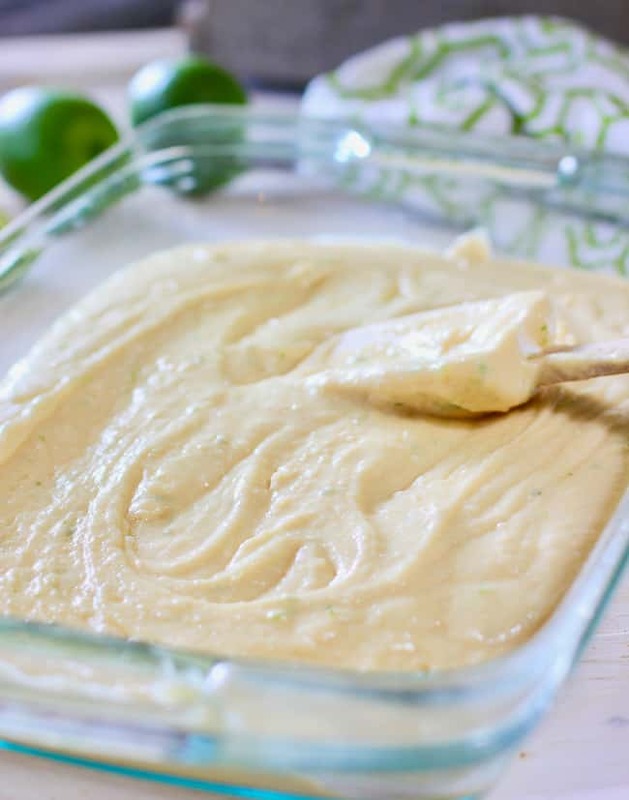 In a large bowl, beat together the butter and cream cheese with an electric mixer. Add lime juice and lime zest. With the mixer on low speed, add the powdered sugar a cup at a time until smooth and creamy. Spread on cooled cake and garnish with additional lime zest. How many people would it serve? You would probably get about 20 pieces of cake depending on how big you sliced them. 5 down the side and 4 across should be about right. Thanks! I made this cake and I must say, it was delicious! It bakes up perfectly and is very substantial and hearty. The frosting is the livin’ end, if you like a little tang. I love this cake! My family loves this cake. This one’s going in my recipe box. That is awesome to hear! Thanks so much for the note! Of course!. This cake is for entertaining; which I intend to use it for. Thanks for posting it! This cake looks perfectly delightful and I’m making it right now for a birthday party later today, but I have a question about the frosting recipe. 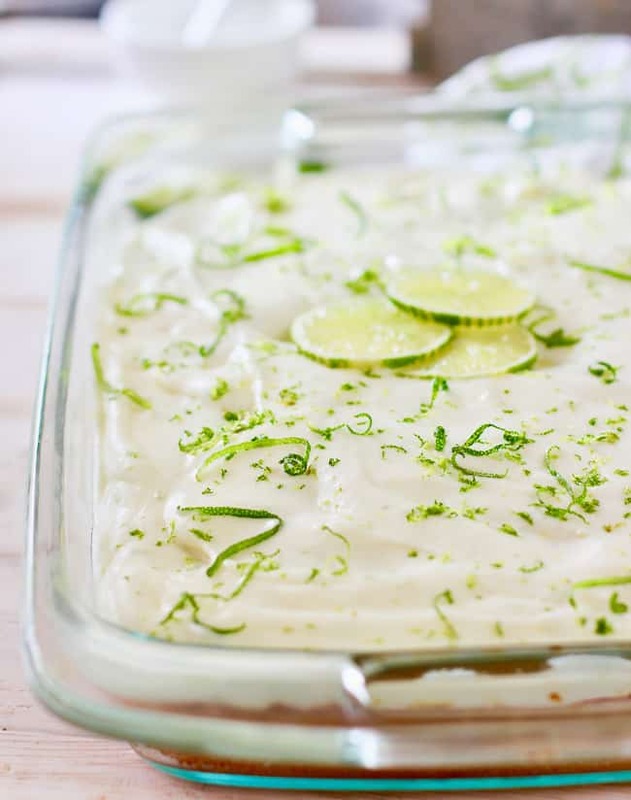 The list of ingredients include lime juice and zest, but in the instructions under that list, you don’t mention those ingredients, but you mention adding vanilla – and there’s no vanilla listed in the ingredients for the frosting. Can you please clarify? Thank you. Argh! My goof and I was out of town and couldn’t respond in time. I updated the recipe to read ‘add in lime zest and juice’ in stead of vanilla. I hope you were able to make it work! Could you be more specific. I don’t see a problem. The instructions for the frosting are under “Frosting”. You might be looking for them under ‘Instructions’ – which I will admit is confusing. But from what I can see they are all there. Let me know if you are still having problems. I am going to make this over the weekend! My key lime tree had a ton of ripe limes and I zested and juiised all afternoon! Thanks for shareing I will get back to you on the taste but as a baker I know this will work! i love key lime. it looks yummy! Yum! 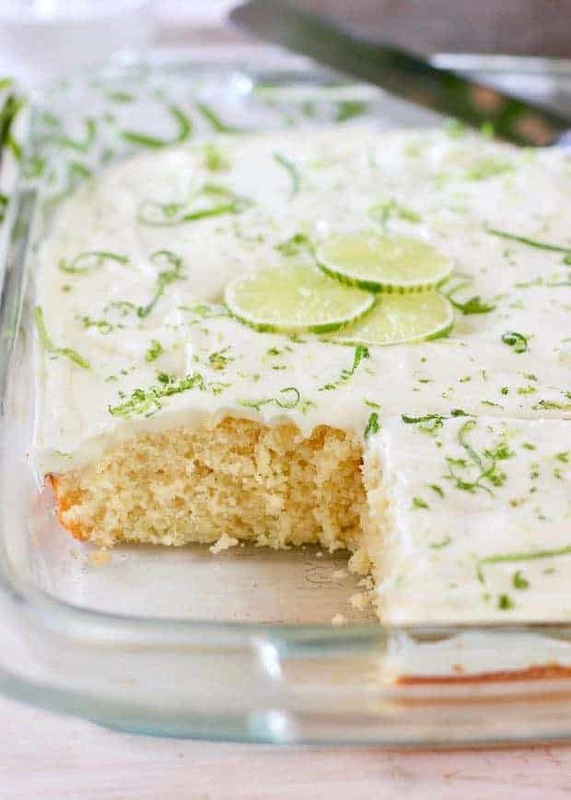 I don’t think I’ve ever had key lime cake, and boy am I craving this right now… 🙂 Pinned it! What a great idea! I love key lime pie, but I almost love cake more. Can’t wait to try this!